I have been fascinated with the incredible popularity of Pokemon Go. Some people are seeing it as an “annoying” new game, but I see it as an amazingly powerful tool to trick people into exercising and getting outside, and as author Mark Wilson observes, discovering your city. In our collective hunt for silly cartoon monsters, Pokémon Go players are discovering history and architecture left and right. Users described their discoveries over the weekend, from Korean pagodas, to a Donner Party memorial in California, to the urban landscape of Perth at night, all documented on Twitter. Lumiere London 2016 is in full swing, bringing with it various light installations to enhance the city’s most famous locations. 30 artworks will be aglow this weekend at places like Trafalgar Square, Westminster Abbey, Carnaby Street, Oxford Circus, King’s Cross, and many others. At the latter, digital studio FIELD—founded by Marcus Wendt and Vera-Maria Glahn—present their stunning sculpture, Spectra-3. The piece is the latest instalment of their ongoing Spectra series, a merging of physical and virtual sculptures that take inspiration from space, technology, and our relationships to them, to provide elegant and sensory experiences using sound, light, and reflection.Spectra-3’s design and movement is inspired by the radio telescopes of the Very Large Array (VLA) located on the Plains of San Agustin in New Mexico. The piece combines computer-aided design with real-time input from the public’s movements, to inform its physical actions as it rotates on motors, augmenting the space with the enchanting hues and patterns of reflected light and spatialized sound.It’s the biggest self-commissioned artwork the studio have ever done. Built from bespoke steel and surrounded by sensors, at nearly 10′ tall, it’s controlled by custom software which commands the motors, lights, haze, and multi-channel sound. During a study-abroad tour of China that I led in May and June through the University of Minnesota’s School of Architecture (read more about the trip here and here), one topic, aside from architecture, that my students and I discussed regularly was air pollution. Although we were in southern and central China, which are less affected than Beijing and other northern cities, we often found ourselves in a murky atmosphere. For three weeks, we rarely saw blue sky even on sunny days, and the air imparted a palpable thickness. We checked the country’s Air Quality Index (AQI) daily via mobile app for the local forecast—especially after a bout of intense allergies sent me to a local pharmacist. This led us to question how we as architects and designers can counter such an ever-present problem. Air pollution influences not only our physical health but also our experience of the built environment. Buildings and landscapes become soft and gritty, losing their clarity, sharpness, and color behind a veil of smog. The azure backdrop that is beloved in architectural representations is rarely witnessed. Rather, gray predominates, at times accompanied by brown. Despite this reality, blue sky persists in renderings of projects in China. read the whole article at via Architecture and the Airpocalypse | Architect Magazine |. An End to Forgettable Stormwater Management? As our climate becomes more unpredictable, finding better ways to manage stormwater is crucial to mitigating flood damage. However, traditional stormwater management strategies can be unforgettable at best and unsightly at worst. 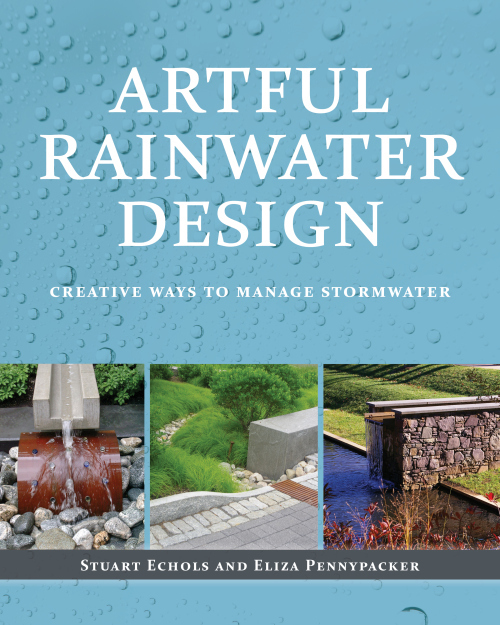 In the new book, Artful Rainwater Design: Creative Ways to Manage Stormwater, authors and Pennsylvania State University professors, Stuart Echols, ASLA, and Eliza Pennypacker, ASLA, prove that this doesn’t always have to be the case — it is possible to effectively manage runoff without sacrificing aesthetics.